The locus tagged by SNP rs272889 associates with a number of acylcarnitines, with isovalerylcarnitine (Metabolon platform) and the valine/C5 ratio (Biocrates platform) showing the strongest signals. This locus also associates with body height. The solute carrier family 22, organic cation/ergothioneine transporter, member 4 (SLC22A4, OCTN1), is annotated as a sodium-ion dependent low affinity carnitine transporter. A key substrate of this transporter has recently been identified to be ergothioneine (Grundemann et al., 2005). In the same paper, SLC22A5 (OCTN2), that is located next to, and in linkage disequilibrium with, SLC22A4 has been shown to actively transport carnitine and acetylcarnitine. The occurrence of rheumatoid arthritis and Crohn’s disease has recently been linked to a variant in this locus (termed IBD5-locus) 14,28. In 2004 Peltekova and colleagues postulated that functional polymorphisms, L503F (rs1050152) and G-207C (rs2631367) in the SLC22A4 (SLC22A4) and SLC22A5 (OCTN2) genes, respectively, comprised a two locus risk haplotype that accounted for the association findings at IBD5 (see also review of inflammatory bowel disease by J. Cho, 2006). Controversy exists over the true causal gene within the IBD5 locus, and it is commonly believed that this controversy can only be solved in studies with higher participant numbers (Silverberg, 2006). To further advance the understanding of the IBD5 locus and its role in IBD susceptibility, Silverberg et al. (2007) suggested that even larger population studies are required that will have adequate power to dissect the high degree of LD found in this region, and this in conjunction with functional studies that will demonstrate mechanisms. Here we show that a GWA study with metabolic traits may deliver new functional information while relying on only modest population sizes. Our results suggest that differences in acylcarnitine transport may play a role, possibly related to the transporter’s affinity to C5 (p=4.8×10-9). Some amino acids may also be involved, since the ratio Valine/C5 associates with this locus (p=7.9×10-15). This is also supported by an improvement of the strength of association by five orders of magnitude when using ratios. The causative SNP here could be the coding SNP L503F (rs1050152) in SLC22A4, which correlates with the SNP reported here (rs272889) with an r2 of 0.351 (D’=0.894) in the HapMap CEU population (Johnson et al., 2008). This variant has been shown to affect the ability to transport carnitine (Kawasaki et al, 2004). Our association therefore represents an indirect replication of this work. Further association studies on this locus with an extended metabolite panel may prove a promising research avenue here. SLC22A4 and SLC22A5 encode the OCTN1 and OCTN2 organic cation transporters and both have documented carnitine transport activity . Ratio interpretation: isovalerylcarnitine is related to isovaleryl-CoA, an intermediate in the breakdown of branch chain amino acid, leucine. Valine, as an additional branch chain amino acid, may be normalizing for the branch chain amino acid pool (‘normalizing’). A recent block annotation of SNP rs272889 using SNiPA revealed SNP rs272893 as a highly correlated non-silent variant in SLC22A4, which corresponds to an Ile to Thr substitution. SNiPA also reports strong eQTLs at this locus with SLC22A4 and SLC22A5 transcripts, especially in monocytes, and enhancer variants for SLC22A4. Cho, J. Genetic advances in inflammatory bowel disease. Curr Treat Options Gastroenterol 9, 191‐200 (2006). Grundemann, D. et al. Discovery of the ergothioneine transporter. Proc Natl Acad Sci U S A 102, 5256‐61 (2005). Peltekova, V.D. et al. Functional variants of OCTN cation transporter genes are associated with Crohn disease. Nat Genet 36, 471‐5 (2004). Illig, T, Gieger, C, Zhai, G, Römisch-Margl, W, Wang-Sattler, R, Prehn, C, Altmaier, E, Kastenmüller, G, Kato, BS , Mewes, HW, Meitinger, T, Hrabé de Angelis, M, Kronenberg, F, Soranzo, N , Wichmann, HE, Spector, TD, Adamski, J, Suhre, K, A genome-wide perspective of genetic variation in human metabolism, Nature Genetics, 42:137-141 (2010). Silverberg, M.S. OCTNs: will the real IBD5 gene please stand up? World J Gastroenterol 12, 3678‐81 (2006). Silverberg, M.S. et al. 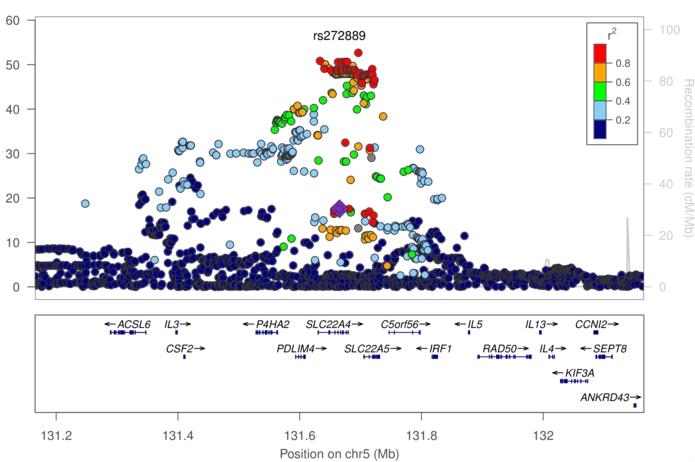 Refined genomic localization and ethnic differences observed for the IBD5 association with Crohn’s disease. Eur J Hum Genet 15, 328‐35 (2007). using HapMap. Bioinformatics 24, 2938‐9 (2008). Kawasaki, Y., Kato, Y., Sai, Y. & Tsuji, A. Functional characterization of human organic cation transporter OCTN1 single nucleotide polymorphisms in the Japanese population. J Pharm Sci 93, 2920‐6 (2004).